There's no doubt that blockchain is in its infancy. And it has yet to prove itself in the supply chain with tangible, material goods. 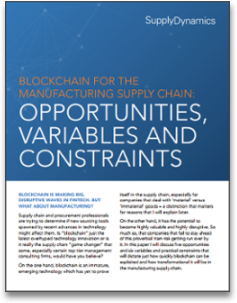 In this whitepaper, Supply Dynamics walks you through blockchain and discusses the potential to disrupt manufacturing. Blockchain & Manufacturing -- is it possible?